Camryn Jo Krause, a bright shining little girl, passed away on April 7, 2019, at her home in Owatonna, surrounded by her family. She was 5 years old. Friends may greet the family 5- 7:00 PM Sunday April 14, 2019 at the Brick Meger Funeral Home, Owatonna. Funeral Service will be 2:00 PM Monday, April 15, at Bethel Church in Owatonna with Pastor Micheal Simmerman officiating. There will also be a two-hour visitation prior to the service starting at 12:00 noon at the church. Camryn Jo Krause was born August 27, 2013 in Owatonna, MN to Nick and Kelly (Petricka) Krause. She completed their family of four. 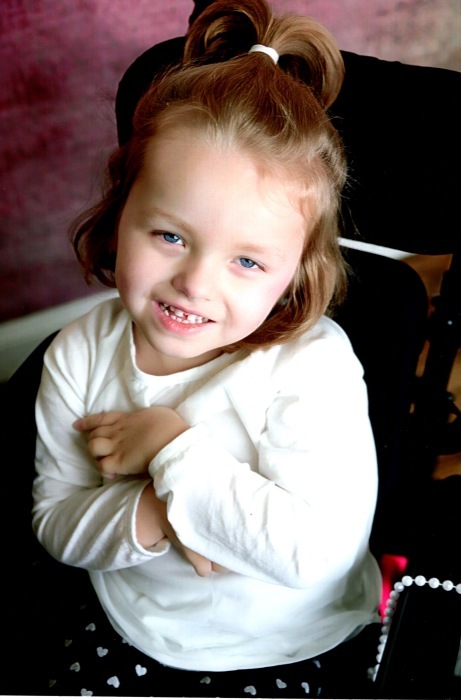 From the start, the development of Camryn’s body and learning progression were markedly delayed, and although she wasn’t able to walk, speak and eat like other girls her age, she was able to light up a room with her beautiful smile. She participated in play through her vocal responses and through the delight in her beautiful blue eyes. The sounds of her soft laugh were enticingly delightful, and her squeals of expression could be heard from great distances. Camryn loved music, getting & giving hugs, eating ice cream, going places, rough-housing play with sister and daddy, her dogs -Stitch, Kimber and Sadie, and especially, she adored her older sister, Addie. Camryn was able to experience many wonderful adventures, all due to the care and efforts given by her friends, family members, loving nurses, and especially through the sacrificial care by her loving mother. The Make-A-Wish program made it possible for Camryn and her family to go to Disney World in February of 2018. Throughout her various hospital stays, where uncertainty was the only constant, the Gillette staff grew to be like family, in their conscientious and personalized care of Camryn. Camryn’s complete diagnosis is yet to be defined. Camryn is survived by her parents, Nick and Kelly Krause, of Owatonna; best friend and sister, Adeline Krause, age 10, of Owatonna; grandparents, Steven and Becky Krause of Winnebago, Mike and Chris Petricka of Kenyon; great-grandparents, Evelyn Krause of Winnebago, Mary Petricka of Faribault and Harold (Toni) Amundson of New Port Richey, FL; Dorothy Rathbun, of Fairfield, IA; aunt, Brandi (fiancé Troy Bauer) Petricka of Kenyon; uncles, Tyler (Kaci) Krause of Columbia, TN and Zachary (Meghan) Krause of Blue Earth; many cherished cousins, great aunts and uncles, other relatives and friends; not to forget her dog, Kimber. Camryn is preceded in death by her great-grandparents, Raymond Dudley Krause, William Rathbun, Alvin Petricka and Shirley Amundson. A special thank you to the many doctors and nurses at Gillette Children’s Hospital in St. Paul for the care they have given to Camryn for the last 5 years. In an effort to help others, especially children like Camryn, the gift of life was shared with many people in need through organ and tissue donation for research. In lieu of flowers, donations are appreciated to: Renaissance Charitable Foundation, Gillette Children’s foundation and Make a Wish Minnesota. Make checks out to: Renaissance Charitable Foundation - Memo: In Memory of Camryn Krause, they can be mailed to the Brick Meger Funeral Home, 1603 Austin Road, Owatonna, MN 55060, C/O Camryn Krause and they will be forwarded to the Krause family. Gillette Children’s Foundation 200 E University Ave. Mail # 010605, St. Paul, MN 55101 Attn: Rachel Memo: Neuroscience Fund in Memory of Camryn Krause. Make a Wish America Gift Processing, 1702 E Highland Ave., Suite 400, Phoenix, AZ 85016. Select LOCAL (Minnesota) chapter - In Memory of Camryn Krause.